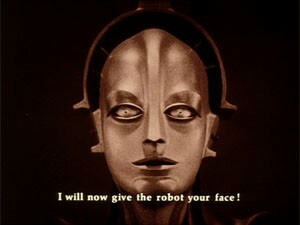 Since it was the first silent film I ever saw, the controversial 1984 edition of Fritz Lang's sci fi classic Metropolis holds a special place in my heart. Giorgio Moroder's MTV-age reconstruction with a contemporary electro-rock soundtrack has its detractors, then and now. It did help expose the art of silent film to a new audience, however, long before entire libraries of early cinema became a simple Netflix click away. Sensing a bit of '80s nostalgia, Kino has reissued this edition on DVD and Blu-ray - but does the film hold up? 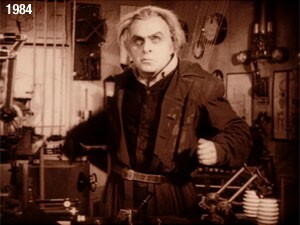 This particular Metropolis edition grew out of Moroder's love of the film and the need to recreate the definitive, original German version of it. Spurred on by the 1980 reconstruction of Abel Gance's Napoleon, Moroder himself set out to track down as many surviving prints of the film he could find. The resulting 82-minute film restored a few previously missing scenes and fleshed out a few other scripted scenes with still photographs. Probably the most radical change came in replacing the original title cards with subtitles written by Moroder and his frequent songwriting partner, Pete Bellotte. Unlike subsequent restorations, this film is visually sweetened with color tinting and the occasional optical effects (note the Xanadu-esque enhancement to the title screen, below). Which brings us to this Metropolis' entire reason for being - the soundtrack! Moroder was quite the hot commodity as of '84, due both to his streak of disco hits with Donna Summer and the spacey, synth-drenched scores he composed for the likes of Midnight Express and American Gigolo. 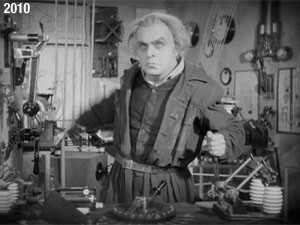 For Metropolis, he supplemented his own instrumental score with an album's worth of contemporary rock tunes. The artists attached to the soundtrack read like the table of contents for Creem magazine, with Billy Squier, Pat Benatar, Loverboy, Freddie Mercury and Adam Ant topping the roster. On paper the idea sounds like a sop to the MTV kids (true to form, they led to much of this Metropolis's negative reception from the critics). In reality, however, the songs are seamlessly incorporated into the score to a neat and even subtle effect. Admittedly, it's odd to come across a pop/rock song with vocals on a silent film score (has it been attempted since? ), but the songs and Moroder's machine-like electronics are mixed as an artful suite. Whenever Moroder isn't indulging in generic '80s chase music (like in the climactic rooftop scene), it's surprisingly beautiful and tasteful. Fritz Lang's powerful imagery didn't need the help of Squier et. al., but it didn't hurt, either. 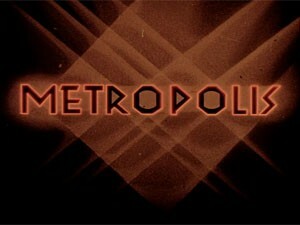 This Metropolis will never take the place of the masterful 2002 restoration, but it is fascinating to watch anyhow. The picture quality is, frankly, awful, which might explain why Moroder's new note accompanying this edition has a somewhat apologetic tone. Certain moments of the soundtrack still have a gorgeous pull, however. It might seem campy when, in the scene where the robotic Maria is created, Bonnie Tyler's "Here She Comes Again" bubbles onto the soundtrack. It's actually an effective bit of '20s/'80s synergy that's still powerful all these years later (weirdly enough, I can't watch that scene without thinking of Tyler's song). Other scenes have a strong whiff of cheese, like Pat Benatar's Generic Ballad Of Hope playing over the ending or a party scene set to Freddy Mercury's hyper "Love Kills" (both the Mercury and Tyler tracks were released as singles, charting in the lower half of Billboard's Hot 100). For Moroder fans, this disc is a must-have. His trademark icy-futuristic synths and Lang's awesome imagery are a good fit. Remember, this was made at the same time Moroder was busy scoring Flashdance and Scarface - which only makes me admire the man even more. Kino has done a great service by putting this Metropolis, controversy and all, back into circulation. The Kino Classics Special Edition DVD of Giorigio Moroder Presents Metropolis comes with its original 2.0 stereo soundtrack and a new Dolby Digital 5.1 soundtrack. Both sound fantastic. Unlike the accompanying image, which nearly 30 years old and looks it, Moroder's drum machines and emotive vocalists sound as if they were just recorded yesterday. This is a downright shoddy looking print of the film. 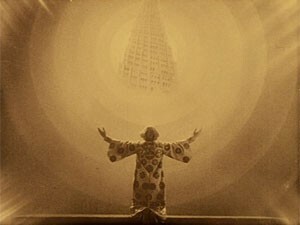 Unlike Kino's prior 2002 and 2010 Metropolis editions, the image has not been digitally restored (see above for a comparison). Lang's wondrous imagery still retains its power, even in this scratched up and muddy state. The disc's main extra is the 18-minute vintage documentary The Fading Image, produced by Moroder himself. The film explores the sorry state of film preservation as of 1984 and Moroder's efforts to track down all available Metropolis prints to cobble together something that resembled the 1927 German original. Also included is a photo gallery of paper ephemera relating to both the original and the reissued films (gotta love those 45 RPM sleeves). Rounding out the extras are new trailers for this edition (not the original 1984 trailer, unfortunately) and Kino's 2010 The Complete Metropolis. 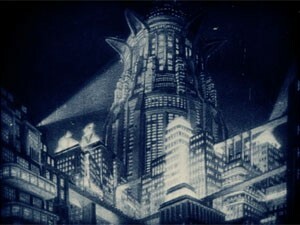 If you've never seen Metropolis before, this is NOT the first place to check it out. Giorgio Moroder's slick MTV-influenced version, for years the only one available, has been usurped by Kino's exemplary restorations of the film from 2002 and 2010. As an '80s artifact the film is priceless, however, and Moroder's chilly synths still have a surprisingly modern potency. Highly Recommended.